The 2018 Pacific Veterinary Conference promises to bring four days of learning, activity, and fun! During PacVet 2018 there are multiple great events that all conference registrants are invited to attend. PacVet incorporates valuable continuing education and a great opportunity for networking! Registered attendees are welcome to enjoy fresh fruit, delicious pastries, premium coffee, tea, and fresh juice. Socialize with colleagues and prepare your schedule before you start your day of CE. Breakfast is served daily from 7:00 AM to 8:00 AM. Continental breakfast on Sunday is from 7:30 AM-8:30 AM. (Breakfast guest tickets are available for purchase online during pre-registration). Connect with colleagues and enjoy lunch on us during the Vet Expo on Friday and Saturday! You will also have the chance to see more than 120 leading companies offering the latest veterinary products and services. 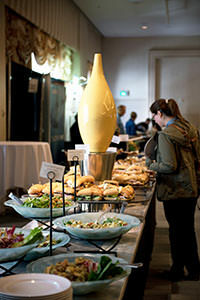 (Lunch guest tickets are available for purchase online during pre-registration).